The increasing concerns across the globe regarding malnutrition has had a revolutionary impact on wheat protein market share. As per estimates, currently, more than two billion people worldwide are deficient in one or more nutrients. Increasing level of carbon dioxide and pollution in general are the major causes of the rising deficiency of nutrients among the people as the rise in carbon dioxide levels tends to reduce the protein in crops. Quite overtly, since humans obtain a majority of nutrients from plants that comprise 63% dietary proteins and 81% iron approximately, regional governments have been deploying innovative policies to increase the production of wheat to ensure food supply and essential nutrition. In line with the surging need for plant protein and supportive regulatory policies, food product manufacturers have been investing heavily to establish new manufacturing plants. For instance, focusing on the growing demand for plant protein across European countries, Cargill has decided to switch from corn to wheat processing at one of its plants based in Germany. With this long-term strategy company is looking forward to meeting consumer demand for plant protein. The firm is also planning to garner substantial returns from renewable energy and sustainable packaging via this wheat processing plant. Driven by more such initiatives and the rising demand for wheat proteins in the regional food processing industry, Europe is likely to emerge as a major revenue pocket for wheat protein market. Though the demand for wheat products has increased tremendously, the climatic changes due to rise in carbon footprints has had a negative impact on the wheat production. Taking into account the huge global gap between supply and demand, the researchers at University of Florida are working continuously to develop a new wheat breed with specific traits. Scientists claims that the farmers could produce sufficient wheat having rich protein content with the newly developed variety. Upholding the production of wheat will have significant impact on the wheat protein market share. According to FAO, China is major contributor of wheat with the production of 126 million metric tons per year, followed by other economies such as India, Russia, Canada, and U.S. The ongoing research related to the advancement of agricultural products will thus further augment the industry trends. In addition to the research institutes, renowned food manufacturing groups have shifted their focus toward strengthening their product versatility in order to fulfil consumers’ requirement. As of now, owing to the increasing awareness about the consumption of healthy diet, most of the consumers have been preferring food products with less fat and high nutrition. Considering the escalating demand, few months before, Manildra Group USA introduced three new varieties of wheat protein isolates. The newly developed isolates possess unique functionality and versatility of application and have generated lucrative business opportunities for Manildra Group. The rise in demand for wheat protein isolates from athletes and health-conscious consumers in the form of dietary supplement will further impel wheat protein market size. The ever-increasing emphasis on the minimization of the nutritional deficiencies across numerous geographies worldwide will have a significant impact on the product demand over the years ahead. The development of high quality and protein-rich wheat breed is likely to enhance the future industry trends. With the surging development of variants of wheat protein, core contenders have been looking forward to gaining an edge over their rivals. 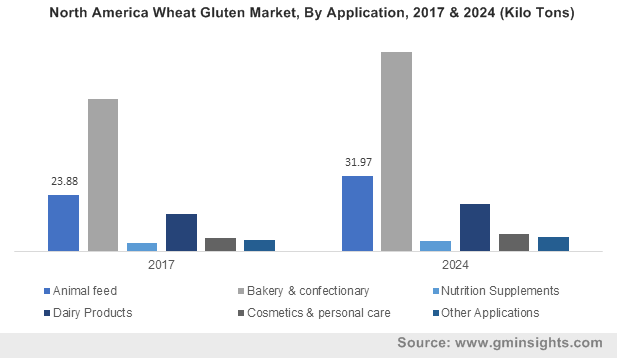 For the record, driven by growing demand for plant-based protein and the substantial awareness regarding the significance of nutrition, wheat protein market size has been anticipated to be pegged at a revenue of more than USD 2.7 billion by the end of 2024.